“Knockout Drops: A Trombone Jag” (1910), F. Henri Klickmann. “At A Georgia Campmeeting” (characteristic march, 1897) Kerry Mills. “The Persian Lamb Rag: A Pepperette” (1908), Percy Wenrich. “Cornetski: A Trumpet Tantrum” (1914), Carleton L. Colby. “Peg O’ My Heart” (one step, 1913), Fred Fischer. “The Kansas City Blues” (1915), Euday L. Bowman. “Liberty Bell March” (1894), John Philip Sousa. “Glances” (gavotte, 1914), Harry L. Alford. “Some Jazz Blues” (slow drag, 1917), M.L. Lake. “The Peacherine Rag” (1901), Scott Joplin. “Drumology” (characteristic solo, 1914), Harry L. Alford. “Stop It!” (one step, 1919), Mel B. Kaufman. “‘Till the Clouds Roll By” (foxtrot, 1917), Jerome Kern. “Alkali Ike Rag: A North Dakota Misunderstanding” (1915) Albert Perfect. “Waiting for the Robert E. Lee & Ragtime Cowboy Joe” (Medley Turkey Trot, 1912), Lewis F. Muir. “The Teddy Bear’s Picnic” (novelty, 1907), John W. Bratton. “Lucy’s Sextette: A Ragtime Travesty on Donizetti” (1913), Harry L. Alford. “I Ain’t Got Nobody & The Neutrality Rag” (medley foxtrot, 1916), David Young & Charles Warfield. “Scott Joplin’s New Rag” (1912), Scott Joplin. “Meet Me Tonight in Dreamland” (waltz intermezzo, 1909), Leo Friedman. “General Mixup, U.S.A.” novelty march, 1905/1906), Thomas S. Allen. “Knockout Drops” (Reprise), F. Henri Klickmann. 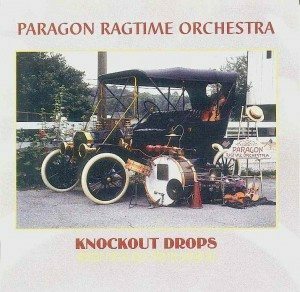 This is the Paragon Ragtime Orchestra’s best-selling recording, probably because it so closely mirrors PRO’s live concerts. This CD presents a great variety of vintage American musical styles; there is plenty of ragtime of course, (including two Scott Joplin scores available on record only here), but also great marches, two steps, one steps, blues, and novelties. Our virtuoso soloists are also featured on trombone (“Knockout Drops,” “Lucy’s Sextette,” and “Alkali Ike”), on cornet (“Cornetski”), and drums (“Drumology,” played on our original 1910 drum set). There is early Broadway show music from Jerome Kern, as well as some astounding “first-time-ever-recorded” tracks: the original versions of “Teddy Bears’ Picnic,” “Peg O’ My Heart,” “Waitin’ for the Robert E. Lee,” and “I Ain’t Got Nobody.” For those interested in modern dance, the Paul Taylor Dance Co. uses this CD to accompany their Oh, You Kid! when it is not possible to have PRO playing for them “live.” Knockout Drops was recorded in spectacular digital audio at the historic Hammerstein’s Manhattan Opera House in New York City; the prestigious audiophile magazine Absolute Sound voted this disc “One of the Top Ten CDs of the Year.” It is a “knockout” indeed!